Vegetable Soup with Dumplings is a great hearty vegetarian dinner recipe. You won’t even notice there is no meat! I love this warm bowl of soup. Start by melting the butter and olive oil over medium high heat in a large pot or dutch oven. Add the onion, celery, to the hot oil/butter mixture. Cook the vegetables for around 2 minute stirring constantly. Add the garlic and chili powder. Stir for another 2 minutes. Dump in the tomato paste, and mix it into everything for another 2 minutes. Pour in the beer, and cook for about 4 minutes (until the beer has mostly evaporated). Pour in the broth. Add the frozen vegetables, potatoes, and beans. Bring the soup to a simmer and cover it with a lid. Cook for around 20-30 minutes. Test the potatoes to make sure they are not crunchy. Taste the broth and add additional salt and pepper to taste. Then start on the dumplings. For the dumpling combine the flour, baking powder, sugar, and salt in a medium mixing bowl. Mix the butter into the flour mixture using you fingers (just like you are making biscuits). Pour in the milk and stir until a dough forms. 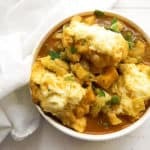 Drop Tablespoons of dough into the hot vegetable stew (Tip from a reader – Bring the soup to a simmer by turning down the heat before you add the dumplings. Thanks for the tip Penelope!). Cover and cook for 15-20 minutes. The dumplings should look light and fluffy.